The Buchanan Retreat (Boclair House) was opened in 1890, the outcome of the generosity of the Misses Buchanan of Bellfield, Ayrshire who wished “indigent and infirm burgesses of Glasgow of the surname of Buchanan and of the age of 60 years complete and upwards’ to be ‘lodged, maintained and clothed in a comfortable and respectable manner’. The restriction to people called Buchanan had to be removed because of the lack of applications from qualified persons of this name. The home accommodated 14 men. In 1960 the Town Council acquired the property, and two years later H.R.H. Princess Margaret performed the opening ceremony 31st May 1962, accompanied by her Husband Lord Snowdon of what are now the municipal buildings. 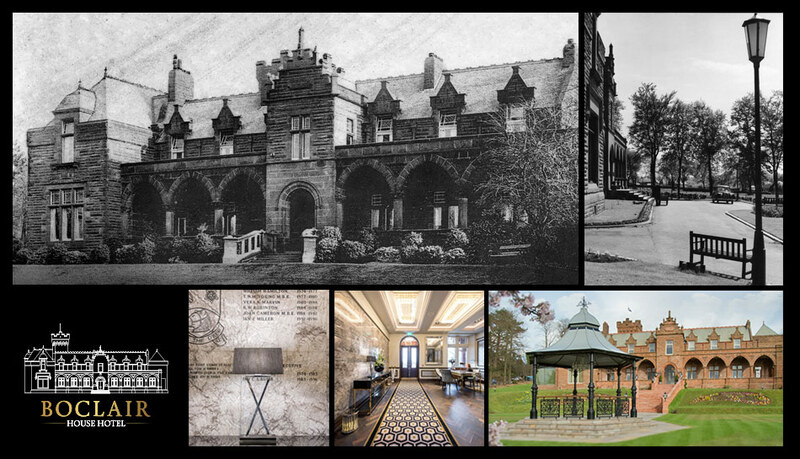 Latterly, it became a home for elderly gentlemen until acquired by the Burgh of Bearsden and opened as the Municipal Buildings by Princess Margaret and Lord Snowdon in 1962. Most recently the building was used as an office by East Dunbartonshire Council. Our hotel has now been transformed into one of Glasgow’s most stylish venues. We have added a modern, glass conservatory to the left side of the building to host all of our weddings and ceremonies. Over the early years of the building, there was a conservatory to the right hand side of the building so it was only natural to be inspired by our rich past and add our modern touch to the building.